For centuries, people have investigated medical properties in natural products. The truth is: many actual medications are derived from herbs and plants. Onions contain many important and essential minerals and vitamins, such as vitamins C and B6, calcium, magnesium, and potassium. It can still be used as a modern-day remedy for treating premature grey hair. Onions are rich in sulfur which is one of the essential nutrients in promoting hair growth. High amounts of sulfur in onions make them particularly effective in regenerating hair follicles and stimulating hair regrowth. This pack having ability for the health benefits of the hair. Avocadoes area rich source of omega 3 fatty acids which help in making the hair grow thick and voluminous. Onion juice is rich in sulfur and hence helps to reduce breakage and hair thinning. In a blender, add ½ cup of olive oil and 1cup of diced avocado. It needs to blend on high speed for 1 minute to get a smooth paste. Then add ½ cup of onion juice. Once more blend for another 1 minute. 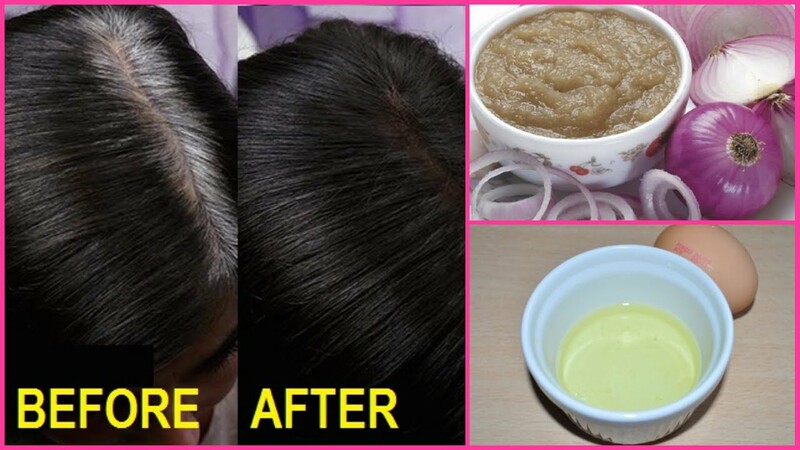 You can now apply this paste on your hair and massage the scalp for 15 minutes. Tie your hair in a bun and allow the mask to stay in the hair for 30 minutes. Rinse your hair with shampoo. Do this remedy once a week. As we all know lemon juice is rich in vitamin C. it helps to add a shine to the hair and also prevents hair fall. It wipes up the excess oil from the scalp and refreshes the scalp as well. Onion juice has anti-bacterial and anti-fungal properties as well which makes it excellent for getting rid of dandruff. In a bowl, put ½ cup of lemon juice and add ½ cup of onion juice then mix well. Simply apply this juice on your scalp and massage well for 10 minutes. Tie your hair in a bun and allow the juice to stay for 30 minutes. Rinse your hair with a shampoo. Do this remedy once a week. These combinations are rich in anti-oxidants. They have a great help in reversing premature grey hair as well. Therefore Beetroot juice may add a red color to the hair. You can replace beetroot juice with curd if you do not like the red tint on the hair. First, take 1 cup of diced beetroot and add 1/4th cup of coconut oil to it. Put altogether in a blender and blend well for 1 minute to get a paste. Now you can add ½ cup of onion juice to the paste and mix well. Just apply the paste on your scalp using a brush. Let the mask stay for 15 minutes. Make sure to use shampoo and condition your hair as normal then rinse it. Do this remedy once a month. Amla powder is made from the ground-up leaves of the Indian gooseberry. It is rich in vitamin C which helps to enhance the texture of the hair. Onion juice nourishes the follicles and promotes faster hair growth. It also prevents problems like lice. This pack has the very effective treatment for the hair issues. Prepare 1 cup of amla powder. Then, add ½ cup of onion juice to it. Mix properly. Wet your hair with normal water. Simply apply the paste on your hair and let it stay for 30 minutes. Shampoo and condition your hair as normal and rinse it well. Do this remedy 2 times a month.